Hi! 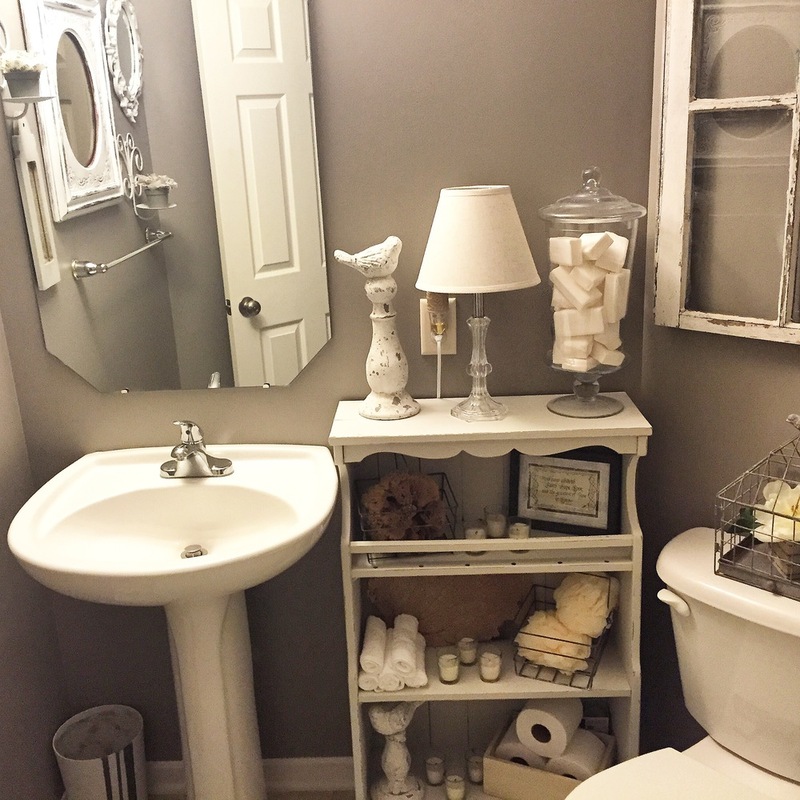 I'm glad you're here to read about my powder room makeover! I am so pleased with the before and after of this project and even more excited that I completed this using ALL materials and decor that I already owned. The cost to complete was FREE! I "shopped" my own home to reuse items I already owned in a new way. I also have a stash of pieces I pick up while thrifting, or while perusing Craig's List. Any time I see something that I know I can make look better, I pick it up! I almost never pay more than $10 for an item, unless it is a key piece or furniture. I have a section in my basement I call the "waiting to be styled" area. This is where I keep my thrifted finds until they find their new space in my home. Let's start with a before shot of this half bathroom. It's a small, awkward space, with angled walls and no windows, so it's difficult to get a shot of the whole bath, but here it is. The space was uninspiring and really lacked decor of ANY kind! I knew I was unable to make major changes, The lighting, sink, mirror, fixtures and flooring had to stay. I planned on making the biggest impact with a new paint color on the walls, and also painting the oak trim. I used Behr Premium paints in Fashion Gray for the walls and Bleached Linen for the trim, both in flat. I wanted to add a bit of storage, although I wanted it to be decorative too. I decided to paint and use an old book shelf I had purchased on Craig's List for $10 to fill the space between the sink and the toilet. I gathered some other wall decor and things to fill the shelf and started painted everything to create cohesiveness. Like these cute little metal baskets I also purchased from the Good Will for $1 a piece. I didn't like the shiny silver, but I knew that could be fixed with paint. I used Americana Decor chalky finish paint in relic that I had on hand. I had previously purchased this from Michael's craft stores. Here is the book shelf, mid paint! I love how the fresh, white color really brings out the details you would not have other wise noticed. Like the bead board finish at the back of the shelves. Some other items I gathered were a miscellaneous collection of mirrors and a couple of wall sconces. They were all mixed colors and didn't really go together before, a coat of white paint and they all look splendid hung together on this wall. Here is the best after shot I could manage! Again, no windows and a tiny space make for hard to photograph room! All in all it is a huge difference and I was very pleased with the results! Some of the other details to draw your attention to would be... ~ The window frame hanging above the toilet. I saved this window from an old salvage yard. Sometimes I am lucky and find old windows for free, other times I pay for them at antique shops and the like. ~The trash can in the bottom left corner. This is a plastic waste can I've had and don't even remember from where, it was covered in roses and so I painted it! I also added the 'french ticking" stripes and it looks like a custom piece for this space. ~To fill the shelves with powder room suitable decor I rolled plain white washcloths from the dollar store and stacked them, placed cream wash "poofs" in the basket, added a sea sponge and a small picture frame. The bird figures were from our master bedroom, but it's the next room to get a makeover, so I knew they wouldn't be needed in there much longer! ~The large glass urn is filled with plain white bars of soap. Simple and inexpensive items really fill the blank spaces and create a lovely, decorated space. One more time here is the before and after! Thanks for taking the time to read through my mini, powder room makeover. I hope this inspires you to change up or add to a space in your home! Even if you have little to no money to spend. You can do it! I love you hear from you so please leave a comment below or feel free to email me!